I just emailed my friend to tell him that making his wall hanging was more of a gift to me than to him, as it made me realize that I needed to make some major changes in my life. He was reminded of a quote that he wrote back to me, "The longest journey begins with a single misstep". He said it was his twist of a "Confucius truism". I had to smile! He finds ways of using few words to communicate what I can't seem to say in many. My Daiwabo hand-quilted wall hanging...the game changer! My life has truly been a very long journey starting with the first misstep of making, what then seemed to be, a rational and logical decision to become a nurse instead of following my first love of sewing and creating lovely things. I remember well that my engineer dad, God rest his soul, who was very smart but not so very creative, gave me the choice of becoming a nurse, a teacher or a secretary. Art and sewing had their place in creating a home, he felt, but I was sent to college to earn a degree as "an insurance policy to have in my back pocket if something should happen to my husband". This "insurance policy" was to be a career. My mother had never worked outside the home, and I think that my dad assumed that I likely wouldn't either. But I graduated and there was no husband and my insurance policy turned into a real life career that didn't always suit me, though it truly did become a way for me to support myself and later would help support my family and it has given me much fodder for good stories. Fortunately I didn't have to become a widow to use it!! From nursing, I went on to graduate school to become a special education teacher, and then an educational consultant. I loved my work, though the best part were the summers off when I could sew and create! 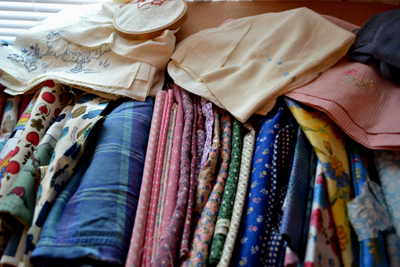 Sewing still captured my heart and I longed to sew more and work less. Our needs were such that it wasn't possible to stay home and when I did, I still needed to make an income, so I tied fishing leaders. I later returned to nursing, and continued raising a family! When I was too ill to work, I found my basement filled with various unfinished projects as well as materials and threads that I had collected but didn't have time to use and this is when Little House Home Arts was born. After making many pincushions I took my wares to market with the help of my husband and daughter and sitting at a small table stitching on my penny rug style wool lap throw at a farmer's market craft show, I told one of my customers that I was a retired nurse when out of the blue, she said, "Clearly you were meant to sew for your work is so beautiful!" I realized then that I had come almost full circle and was at last doing what I loved most! I wasn't making much money, but I was at peace! 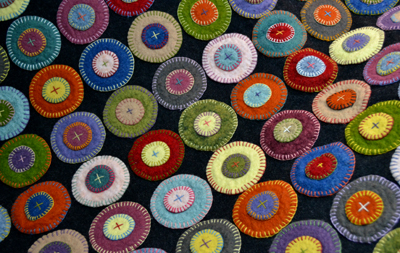 My Penny Rug Style wool lap throw that I would sew on at shows. 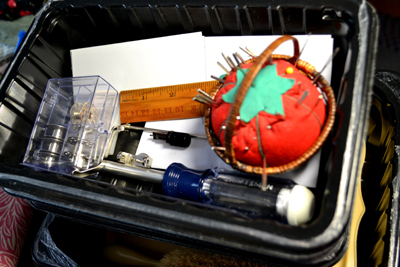 Pincushions were my marketable samples of my hand-stitching. In the back of my mind, however, I planned to get back to quilting. After I emailed my friend about my beautiful collection of Japanese Daiwabo fabrics I had purchased from sewitsforsale@yahoo.com, he came to visit me from California and ordered a quilted wall hanging. After finishing it, I appreciated that his request had pushed me into making the changes that I had longed to make. 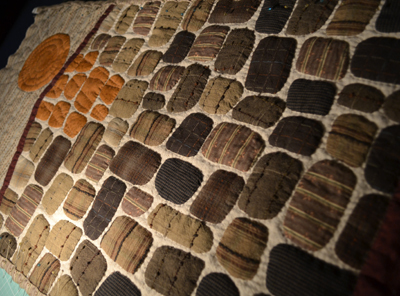 He had listened to my dreams and in seeing my collection of quilts in various states of completion, he ordered a quilted wall hanging out of my favorite material. His challenge forced me to do what I couldn't quite figure out how to make happen in a long while...to quilt. I was realistic and told him I couldn't start his piece until after Christmas. Before Christmas, I furiously pieced duvet covers for my girls and I also started to cut strips from materials that I had received from a girlfriend. Her mother had died and opening the box of her mother's materials, I immediately envisioned a simple 9 patch/9 patch scrap quilt for her, and once again my do-list grew! 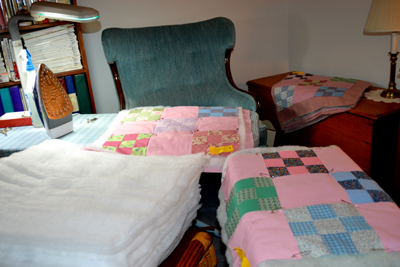 Materials from a friend, whose mother passed away, a special memory quilt!! I felt like I was going a bit crazy, but couldn't seem to help myself. 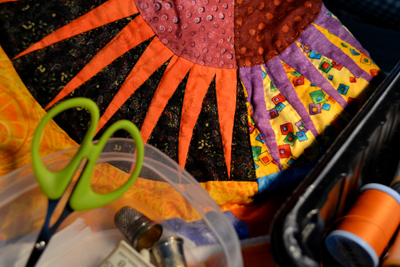 I was going in a zillion different directions and so I gave serious thought and study as to how to organize myself and my materials and unfinished quilts in such a way that I could start to complete them. 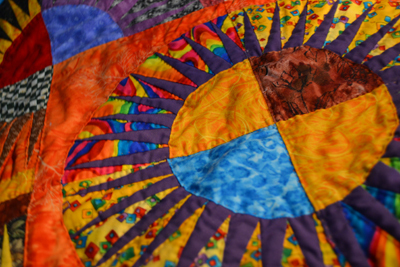 I listed all the quilts that I wanted to finish and added my two new quilts to the list, and with much study of well known and prolific quilt makers, I began to dream and scheme as to how to organize and work on quilts like I worked on pincushions. I estimated how long it would take to complete each one. I figured if I worked on them "factory style" and grouped them into the various tasks needed to complete them and then created changes in my work spaces and schedule, I could incrementally get them all finished and create even more. I even wrote blogs about some of my ideas, a three ring circus modus operandi became a multi ring circus model instead as I needed to factor in my life tasks as well. 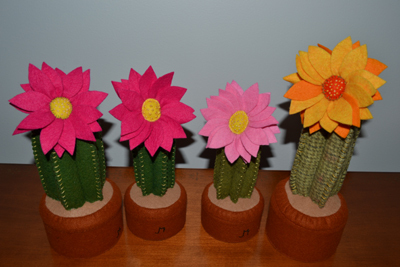 I was moving from pincushions to quilts and from short-term to long-term creations. It seemed like a logical progression. I started making incremental changes at first and only now can I see just how much needed to be altered. Initially, it didn't feel like I got as much sewing done but my reorganization will save time in the future! More blogs will ensue about the the other areas of my life that were changing simultaneously. Change, I find, often brings about personal transformations. 1) Wanting to finish my unfinished long term projects, I went through each one and grouped the materials needed to complete it, and then wrote directions and placed them in its own plastic sleeve to keep with each project. This enables me to move from one project to another more easily, picking up where I left off. This also provides much relief that should the project get passed to someone else to finish, they would have all that is needed to complete it. 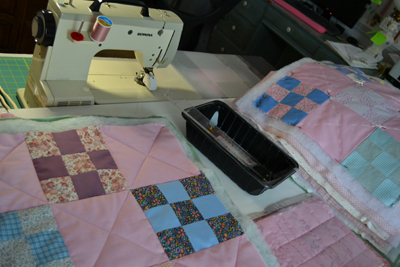 Nothing is sadder than a partially done heirloom quilt without the materials to finish it. I have never been a person to do only one project at a time and I am learning that many people work this way. Plastic sleeves are used for directions for each quilt and also for new skills. Practice stitching with notes re machine settings and hand positions. 2) I select a few projects at a time to focus on, moving each one along incrementally, with pauses to problem solve and alter my design as needed. This means that I always have something available and ready to work on each day, both on the machine and by hand. I made schedules but find I rarely stick to them. Some days I get more done than other days, but do what I can, as I can. My recent projects included the Daiwabo hand-quilted wall hanging; a small quilt to practice hand-quilting prior to and after quilting my wall-hanging. I also focused on two 9 patch/9 patch quilts that I worked on in incremental steps, piecing them and am now quilting them by machine in a quilt-as-you-go fashion, as well as a small lap throw quilt to practice more straight-line quilting. By practicing the same skills over and over, I am mastering them before moving to more complex stitching. 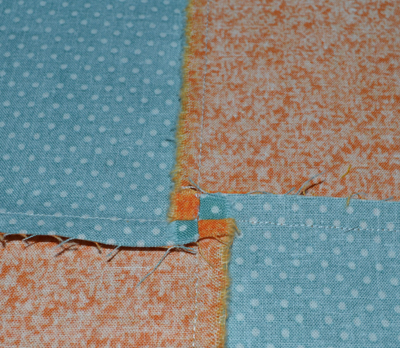 Practice straight line and stitch-in-the-ditch quilting. 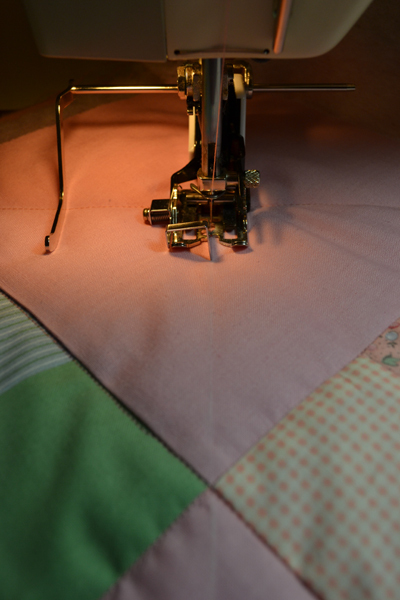 Practice hand-quilting on this New York Beauty Quilt. Hand-quilting outlining design so far. 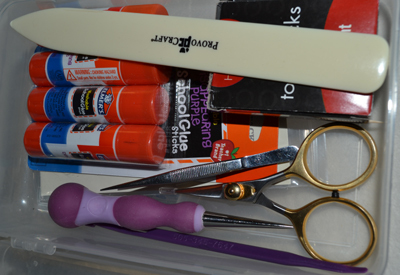 3) Looking ahead at what new skills I want to learn, I organized the tools needed to do them into boxes or trays that I can pull out to use at my sewing table or simply stack trays of what I need next to my machine. They include: an applique box with a stiletto, glue sticks, tweezers, laying tools, sharp pointed scissors and my freezer paper close by; a hand-quilting sewing box with chalk marking pencils, hand-quilting needles, Sashiko quilting needles, thimbles and quilting wax; several assorted machine quilting trays (I used plastic meat trays as they are free). In one tray I have all my machine quilting needles; in another scissors, small ruler, screw drivers and a machine cleaning brush; in yet another, I have medium-sized safety pins; in another, my quilting threads for my current projects; another contains chalk with a clear ruler to mark quilting lines; and in the last, I have my quilt clamps. 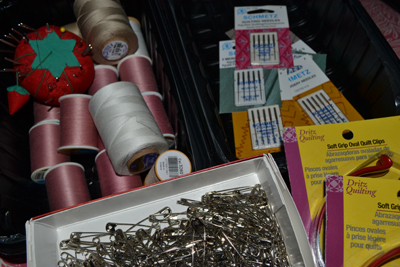 I have many other assorted quilting threads that I store elsewhere. I also have quilting stencils in a large flat plastic bin that is stored in my basement, keeping out only the ones I am using. My applique box for glue-stick technique applique. My machine quilting tray with machine tools, bobbins etc. 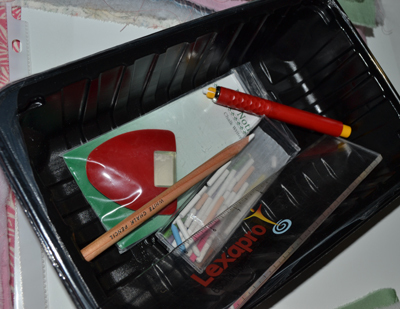 My machine quilting marking tray and ruler for straight lined quilting. Bernina, backed with quilter's ironing board and stack of trays with all I need. 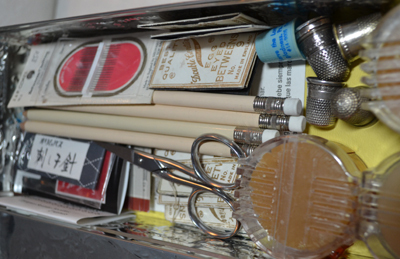 Trays have quilting threads, quilting needles, safety pins and quilt clamps. 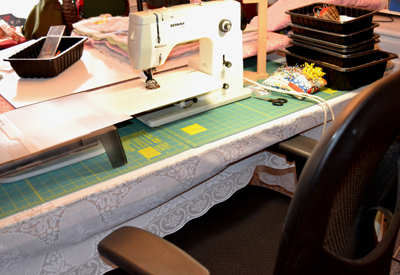 4) I purchased a bigger work table for my living room at a second hand store and switched it to the right side of my living room so that I can extend my sewing machine table and add an ironing board to the left side to better support bigger sewing projects like quilts. 5) I selected a specific semi-soft chair in my living room next to a blanket chest to set up my ironing station. I can press fabrics or blocks and use the chest to place my blocks, or materials or can even hang pieced strips on the door of my TV cabinet. My ironing board station temporary set up for making quilt sandwiches. 7) I purchased a big quilter's ironing board which is presently on top of my dining room table, (it is portable so it can be used in my basement studio as well to press large materials/and/or quilt tops). 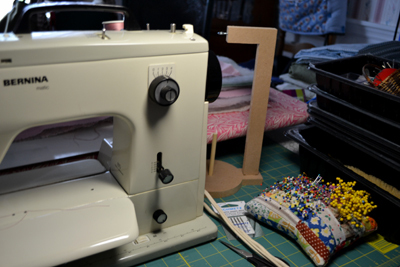 It is just the right height when sitting on top of my table to match the level of my sewing machine table to support large quilts so the weight of materials will not pull on my stitches when I sew. 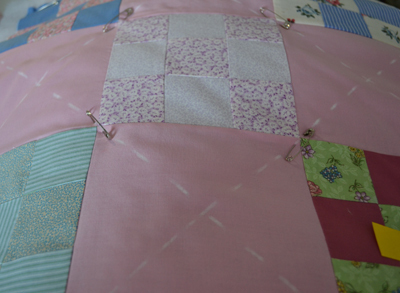 A quilter's ironing board on my table to support my quilts as I sew. 8) Next to my machine I have used my Husquvarna plastic extension sewing table, partially supported by a plastic storage container and with a couple plastic file folders taped to the top to fill in the hole that fits my other machine. This make-shift extension table is added to my Bernina machine sewing table to make it bigger in front of the large ironing board, again making a platform to support my quilt as I sew. 9) I have purchased a dual feed quilting foot for my old style Bernina and have my other old Bernina in the living room on my sewing table or on a folding table behind my chair. They both use all the same accessories and so I can quilt in either room, but for now I am quilting in my dining room and doing regular stitching in the living room. A dual feed quilting foot for straight line and stitch-in-the-ditch quilting. 10) I have washed, ironed and stored my special quilting fabric collections (quilting wools, Daiwabo, homespun, Civil War and 1930 Reproduction materials) in separate flat plastic bins. My general sewing fabrics collected through the years are stored in other containers by color. I have also started filing my extra quilt pieces by size into labeled plastic trays for easy ready-to-use future piecework. Likely these will become plastic containers in the future, but for now trays are sufficient. 11) Years ago I covered two insulation boards to pin blocks to, and have a larger one that is hanging on the wall in my sewing space in the basement. The portable ones have been the most functional for me to lay out quilt blocks or use for my wall hanging, placing it upright to view and better plan the layout of my fabrics. One is 16" x 21 1/2 " and the other is 22" x 35" (simply scraps from making my wall board). 12) My husband recently treated me to a new ergonomic chair for my computer that will double as a quilting chair in my dining room. I cannot believe that this wasn't the first change to be made! For years I have used foam cushions on top of chairs to create the right height for sewing or ironing and still resort to this at my living room work stations. 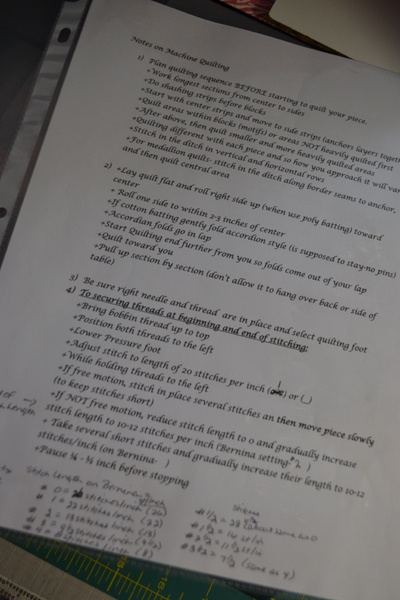 Being "ergonomically" comfortable to do tedious sorts of tasks is critical! An ergonomic chair! (note make-shift quilting table extension to support quilt. 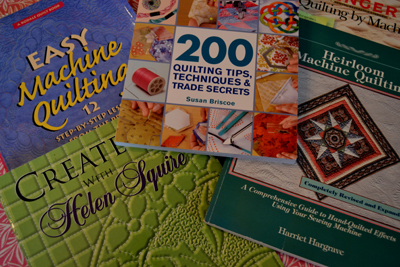 13) I have reorganized my collection of quilting books and magazines for easier referencing. I inherited my mother's quilting books and along with my own, find them invaluable and have my computer in my dining room sewing area as well. It is a wonderful resource for immediate instruction! 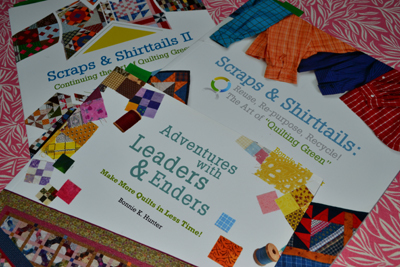 Resources for machine quilting for the DIY method of instruction. Although it feels like I have worked at a snails pace the last eight months, I have completed my wool, log cabin lap-sized quilt, the Japanese Daiwabo hand-quilted wall hanging and have pieced blocks for a queen and king-sized quilt that I am now in the process of machine quilting along with two other small lap-sized quilts for both machine and hand-quilting practice. I am frankly surprised that I have accomplished this much as I have taken much time to read and learn new skills, plan changes in my work areas and taken time to actually prep and re-organize. I have also dusted off old skills not used in a long while. 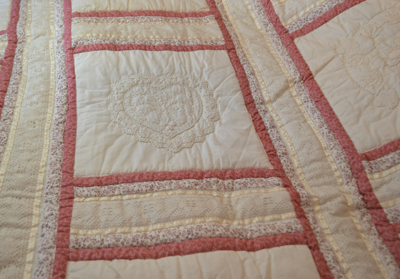 I had never before machine quilted a bed-sized quilt. 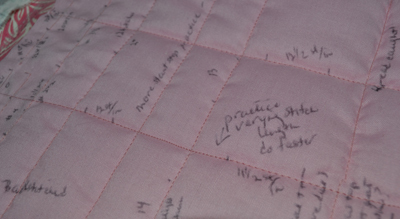 My mother loved the quilt-as-you-go-method to make it easier to work on her quilts in blocks or strips that are later joined to make large bed-sized quilts. Using this method to machine quilt my full-sized quilts, by large blocks on one and the other using long strips of blocks, will give me much confidence when I use this same method to finish two more quilts in the future! I have also learned: more efficient ways of cutting out projects; doing piecework on the machine with greater accuracy using lightweight cardboard guides; pressing quilts seams by setting seams first to make them lay flatter for quilting; and using a new glue-stick method of hand-applique that increases my precision for detailed work. 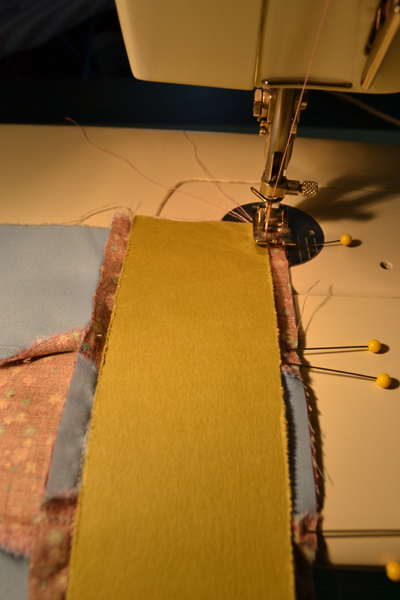 I have practiced hand-quilting, and am learning to machine quilt, using stitch-in-the-ditch and straight-lined quilting using a dual feed quilting foot. My end goal is to be able to do all kinds of quilting techniques on the machine as well as by hand. My mother and I used to consider it sacrilege to even consider machine quilting, but the older I get, the more realistic I have become! At quilt shows I rarely see hand quilted quilts, which speaks to the time constraints all of us have, along with the advancement in technical machine quilting skills. 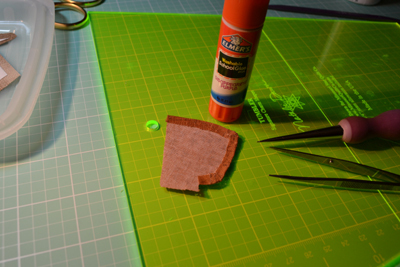 More precise piecing using a light weight cardboard guide. 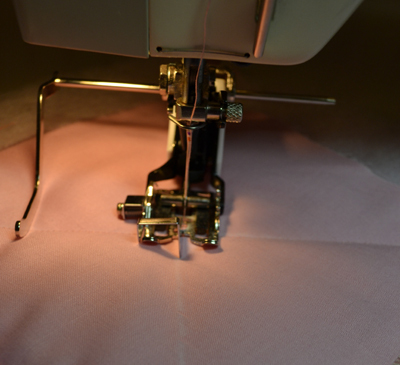 Precise pressing for flatter seams. By learning new skills and then practicing them on several projects, I am gaining the confidence I need to move more proficiently through my work. I didn't realize it, but the projects I have procrastinated doing are ones that I am most insecure about. I am a perfectionist and the only way to do the quality of work I want to do is by practicing and mastering my skills. I am adding patience to my list and hope I get more of it RIGHT NOW ! I have a sign in my sewing area that reads "finished is better than perfect" though I would like my work to be both finished and perfect! Regarding the subject of perfection, I learned to fix errors when I worked on the wall hanging. It is a problem solving skill that I used to hate! I often used to trash many a project if it wasn't perfect. I am learning creative ways to correct or hide my errors. Correcting work is a critical skill to have when doing long term projects, and I have to remind myself that Amish quilters, whose work is next to perfect, purposely create an "off block" for "only God creates perfection." I confess that I am still overwhelmed with how many UFO's are waiting to be finished, but I can now imagine getting them done and making more as well. What I am learning today will get easier and better tomorrow. I do realize that I have many stitches ahead of me and that talk is only talk, but I am beginning to see the fruits of my efforts and finishing my long awaited unfinished quilts seems more possible and probable! These are big changes for me, but stay tuned. The changes at Little House don't stop here! This blog is dedicated to SN who started all this change with his request for me to make him a quilted wall hanging. My thanks to him! Labels: Sewing studio changes for efficient quilt making; personal transformation; organization for prolific quilt making;Quilt Inspiration:Bonnie K Hunter, Teresa Rawson; Old Quilter/New Ways.